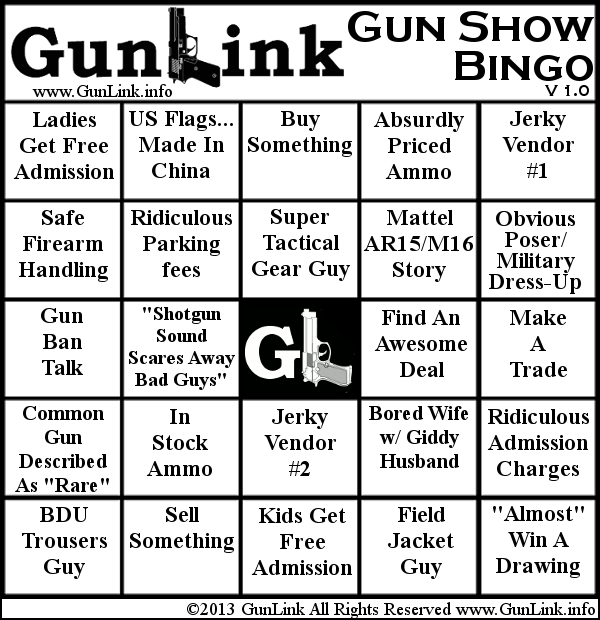 Gun Show Bingo Is Here! Heading out to a gun show? 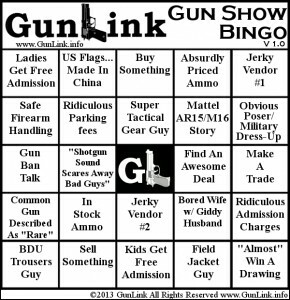 Spice things up and have a little bit of extra fun by printing out this GunLink Gun Show Bingo card to take with you. Be sure to take enough for your friends and family who go with you – and maybe a few extras for people you meet there. Got a booth of your own? Get people talking about you by printing out some game cards for customers that stop by your table. If you have suggestions for new squares, changes or want a custom board, share them in the comments below or on the GunLink Forums Gun Show Bingo thread. Keep your eyes open for other firearms related bingo cards from GunLink coming soon!